Finding convenient, cute, easy to clean and SAFE cups, dishes, bowls and snack containers for our kids shouldn’t be stressful! BPA free plastic options are plentiful, but given the reports about the dangers of BPA substitutes we tend to avoid plastic altogether. Luckily, there are some wonderful, kid-friendly options in everything from stainless steel to glass (yup, even for kids). Read on for our favorites! DISHES I have mentioned the Innobaby Bus Plate here before. It’s a hit in our home – Little M always like to make sure that all the sections are filled with something, the mains go in the wheel compartments and the windows are saved for extras like an added veggie, some ketchup, fruit or even pickles! 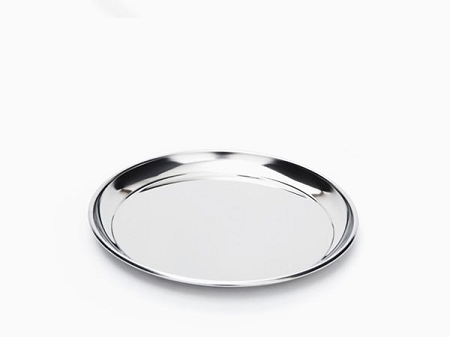 I love to use stainless steel plates, bowls and cups for the kids. Our plates are all from Onyx Containers and I couldn’t recommend them more highly. They have held up to years of use, we wash them in the dishwasher and they still look as good as new. 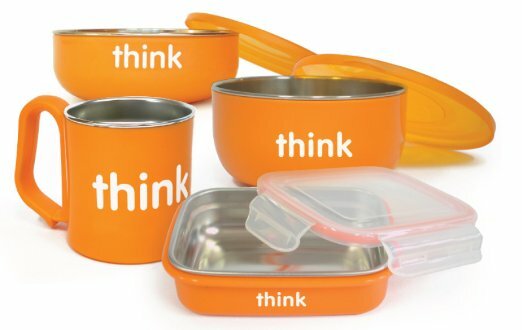 I like these Thinkbaby Bowls – we have both the low rise and the cereal bowl sizes. I must confess though, we pretty much just use the stainless steel part and don’t bother with the orange outer layer. CUPS Little M loves his straw cups, but it’s nice to have regular cups at home too. Onyx Containers once again comes to the rescue with these wonderful tumbler cups and double walled mugs. They are a great size for small hands and Little M uses them every day. SIPPY AND STRAW CUPS One of the complaints I hear most often is how hard it is to find safe straw and sippy cups! 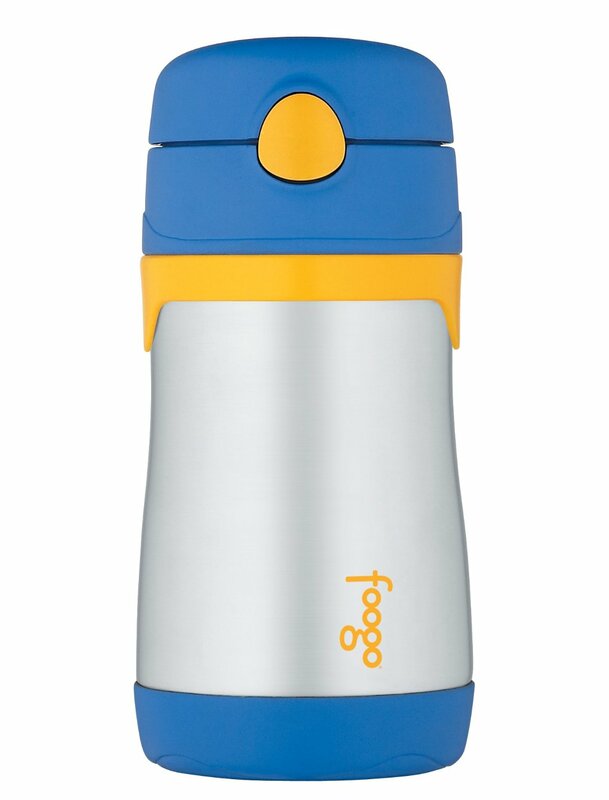 Our favorite cup is definitely the Stainless Steel Thermos Foogo. 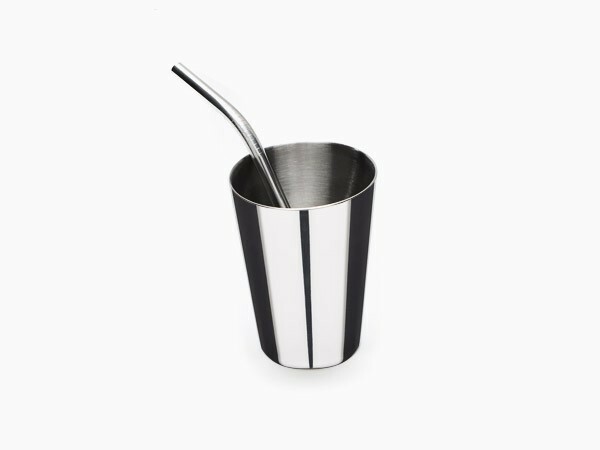 We have the straw cup and it’s perfect for everything from water, to milk to smoothies. Baby M has even started to use the straw version for water. Pura Kiki has a wonderful cup that is completely stainless steel with silicone for the straw – there is no plastic at all! It’s available in a sippy version and a recently released straw version. Lifefactory glass bottles are a surprisingly good choice for little ones. 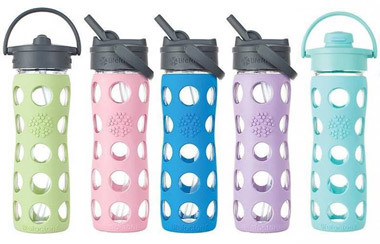 These are obviously better for kids who aren’t still throwing their bottles to the ground, but the silicone sleeve does offer some protection from falls. The bottles come with straw caps (made of plastic) or classic caps. SNACK CUPS We love our stainless steel Eco Vessel Snack Cup. 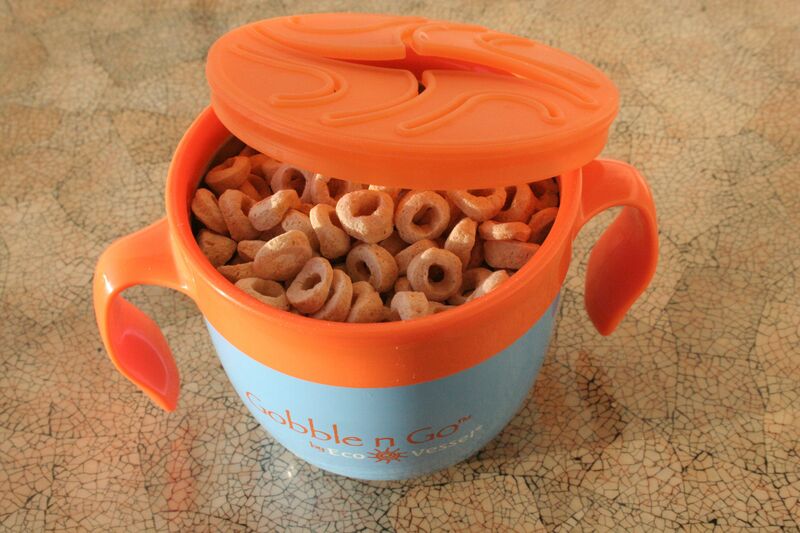 It has large handles that are easy for little ones to grab and it’s easy to fill and take for snacks on the go. 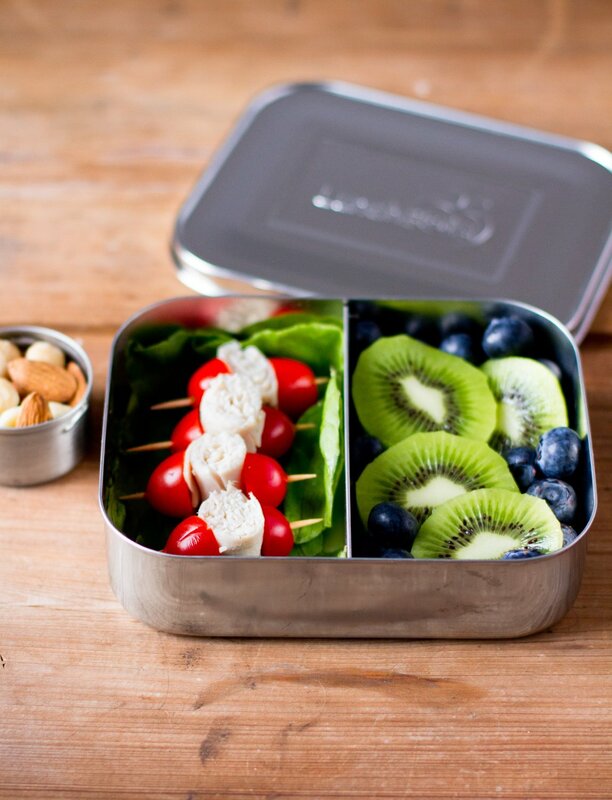 I have to mention Onyx Containers yet again – we have their airtight stainless steel container and it is perfect for transporting everything from crackers to cereal to fruit. We also have the small condiment container, which is ideal for small snacks like raisins or dips like ketchup or hummus. Kids Konserve has their own line of small round snack containers with lids. For larger snacks, we like Lunchbots containers. 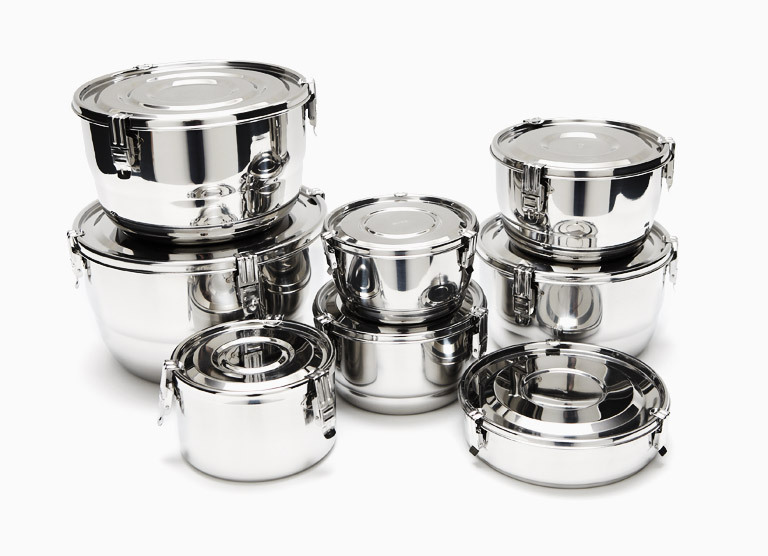 They are available in various sizes and made of stainless steel (some with plastic lids and some with stainless steel lids). 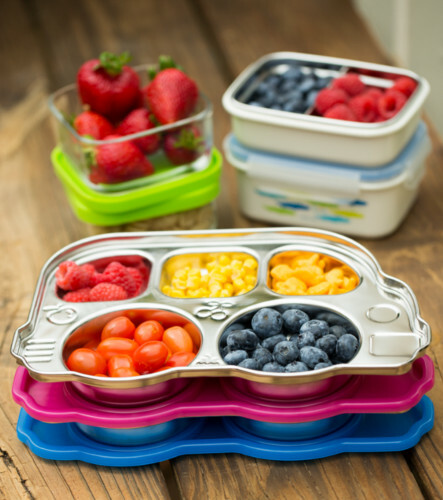 The divided compartments make it easy to organize snacks for little ones. STAY TUNED for the Second Part in our Safer Dishware Guide. I will be writing about our favorite lunch boxes, food storage containers and freezer safe storage.